September 15th, 2018 - Crime is Terribly Revealing — This is Lit! In this episode, Casye and Elizabeth will take on one of the great crime novelists of the 20th century, Agatha Christie. 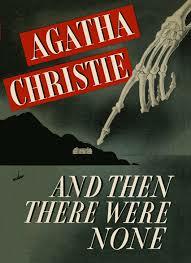 Casye and Elizabeth will be discussing And Then There Were None. Do yourself a favor and look into the history of the title of this book. It will come up. The novel explores the thin line between murder and negligence and intent. There has always been a thin line between justice and revenge. Where is it? Who has the right to be judge and jury? Why are we asking so many questions? Will the girls be able to solve this before the end of the book? Elizabeth won't, but she'll try. Casye will because she's awesome like that. Ten strangers are summoned to Solider Island under mysterious circumstances. They are ready for a lovely summer holiday. Then, it comes out that each one of them hides a terrible secret. The 10 guest discover they are trapped on the island with a murderer. Who will survive?